#17M: Altamira in Olive Green | Denis blogt! 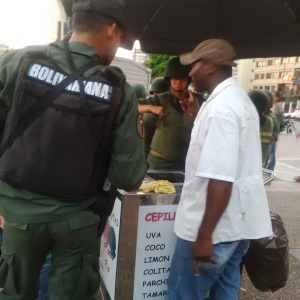 National Guards cool off with a snow cone. I wake up to the soothing sounds of a chopper; like a giant mosquito that you just can’t swat. Check my phone: Monday, 6:45 am. Insane tweets from people I’ve been meaning to delete from my timeline warn of a looming suspension of constitutional guarantees. Others, more grounded, point towards the military takeover of Plaza Altamira, the focal point of student barricades (guarimbas) and Playstation-like combat with the National Guard for the past month. At 3:00 a.m. the military took control of Avenida Francisco de Miranda and, with great pride, conquered Altamira.